Summer is a time for discovery, learning and friendship. Whether you’re looking to fill a particular time in your family’s schedule, or are seeking opportunities for your kids to explore their passions, the Y is here to help you with engaging summer programs. Summer Power is for kids in grades K-5 and offers exciting activities, special themes, field trips and clubs. Sign up for 3, 4 or 5 days a week. Summer Sports lets kids in grades 1-6 enjoy fun, team-based sessions that include sports skill development and games. Summer Uproar offers fun adventures and field trips for kids in grades 6-8. Uproar participants will get a taste of leadership as they help plan their activities. Sign up for 3, 4 or 5 days a week. Day Camp for kids ages 4-14 gives kids a fun day at camp to participate in traditional camp activities, or focus on a special interest. Choose from 1- or 2-week sessions. Overnight Camps give kids ages 7-17 an opportunity to build memories and friendships over a few days or a few weeks. 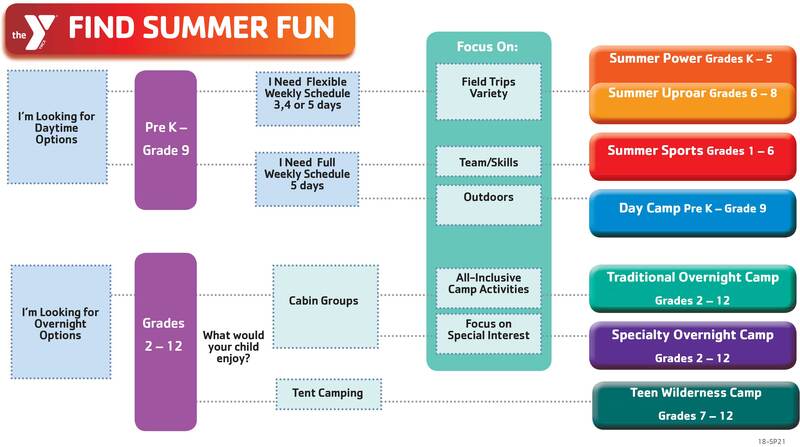 Overnight camp options include traditional camp experiences and specialty camps that focus on a particular activity. Teen Wilderness trips for ages 12-18 head out on adventures to canoe, backpack or go rock climbing—for a week or for the summer.